When guests arrive from other countries, a country's main international airport is the first thing they see and experience, to evaluate the whole country. Accordingly, most countries in the world, also in Asia, made their international airports a world of it's own. Restaurants, shopping centers and even a swimming pool (Singapore), one finds for example in Singapore, Bangkok, Kuala Lumpur etc., but not so in Manila. The international airport in Manila however, is more like a prison, which you can enter only, when you can show a valid ticket and your passport. As you enter the building, your baggage is X-rayed, all the papers checked and you have to pass through a body scanner, without a belt, jacket and purse, of course. A few years ago, a German citizen got so upset about the checks that he dropped his pants and ended up in jail for a few days. So if you were brought to the airport by some relatives or some friends, you have to say good bye to them outside the airport building. They are not allowed to get in. After the entrance checkpoint, you end up in a relatively small hall with no chairs, where you may join the queues at the check in counters. Please note that there is no Left Luggage Counter at Manila Airport (any terminal). The only option for your luggage, if you have a few hours until your flight, is the nearby Mall of Asia! A huge shopping mall and only a few minutes or 150 Peso by Taxi away from the airport. There you will find a luggage counter for an unlimited number of pieces and you can spend and enjoy the whole day in the mall. The airport in Manila consists of four main terminals and passengers of almost all international Airlines will arrive at the old Terminal 1! After disembarking the aircraft, follow the other passengers to the immigration checks and look for the assigned belt in the baggage claim area. Beside the belts and still inside the building, you will find some money changers where you can change some money to pay for a taxi and maybe a hotel room. The exchange rate here is not the best so don't change everything at once. There are also some people selling SIM cards for the different mobile phone companies of the Philippines. Normally you can buy this start up packages for only 30 Peso but at the airport, they sell them for 150! When you step outside the building you find metered Airport Taxis at the far left side of the building and a free Shuttle Bus to the other terminals at the far right side. A ride to T2 will take only 10 Minutes but it's 20 to 30 Minutes to T3. If you are in a hurry, take a taxi. Please be aware that the airport taxis charge about twice as much as the normal city taxis. The meter in the airport taxis starts with 70 Peso, normal taxis is only 40 Peso. 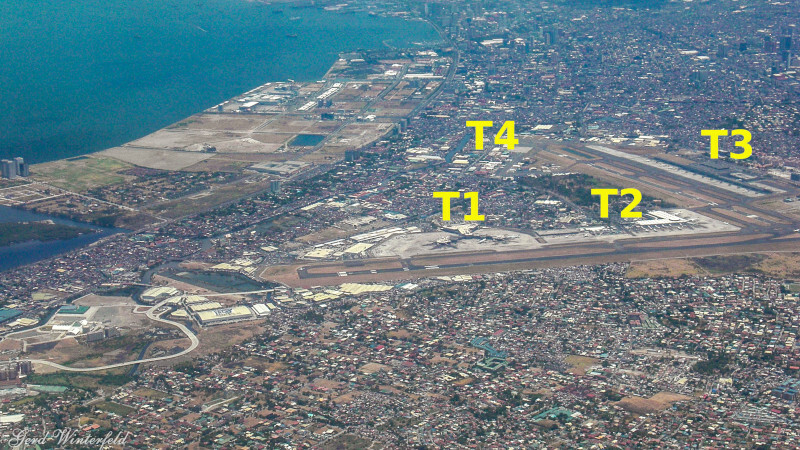 As I already said, the airport in Manila consists of 4 Terminals: The oldest Terminal 1 handles all international flights of all international airlines. Terminal 2 is for Philippine Airlines (PAL) only and the newest Terminal 3 is for all other domestic airlines like Cebu Pacific and AirPhil Express. A taxi ride from T1 to T2 takes only 10 minutes but to get from T1 or T2 to T3, the taxi has drive to the opposite site of the airport and that may take 20 -30 minutes. If some day you have to leave this wonderful country, this will most likely happen via the old Terminal 1 at Manila's International Airport. Due to the already mentioned lack of seating and other entertainment venues at T1, you should arrive at the airport as late as possible but still early enough to compensate for possible delays at the check points for entering the building. The Airport Tax of 550 or 750 Peso (or more?) is now included in the ticket price. In recent years you had to pay it in cash in the airport. This is still the case at all other international airports in the Philippines but not so in Manila. After you checked in your luggage and got your boarding pass you have to pass through Immigration, before you'll enter the Departure/Transit area nad the gates. Here you find a few snack bars, Coffeeshops and Restaurants where you can buy some overpriced sandwiches and drinks. Maybe the last "rip-off" point in the Philippines are the money changers in the departure area. If you want to change your remaining Pesos into foreign currency they will hand out only straight numbers and keep the change, sometimes up to 200 to 300 Peso, for themself. Not so much you might say but with a few thousand passengers every day, it adds up!